The literal translation of the name of this very traditional Tuscan soup,called acquacotta, is "cooked water," which probably doesn't sound very appealing, but though it's simple and quick to make, it's also rich, savory, and satisfying. It's reminiscent of the old folk tale of "stone soup," in a sense -- a soup with a rather poor name, made with scraps and leftovers, but ending in a dish which is greater than the sum of its parts. It is, at heart, a rustic peasant dish, made by boiling onions in water (instead of broth) together with whatever vegetables were available, and served over toasted slices of stale bread sprinkled with toothsome grated Pecorino cheese -- a thrifty way to use up stale bread that was too hard to eat. The bread would soften in the soup and make it into a more substantial meal. The earliest versions of this soup might have been as simple as onions sauteed in olive oil, then simmered in water with a little tomato and served over the toasted bread. There is not really one true recipe for this dish since it was made with whatever was on hand, so feel free to follow the season and your preferences to come up with your own version. 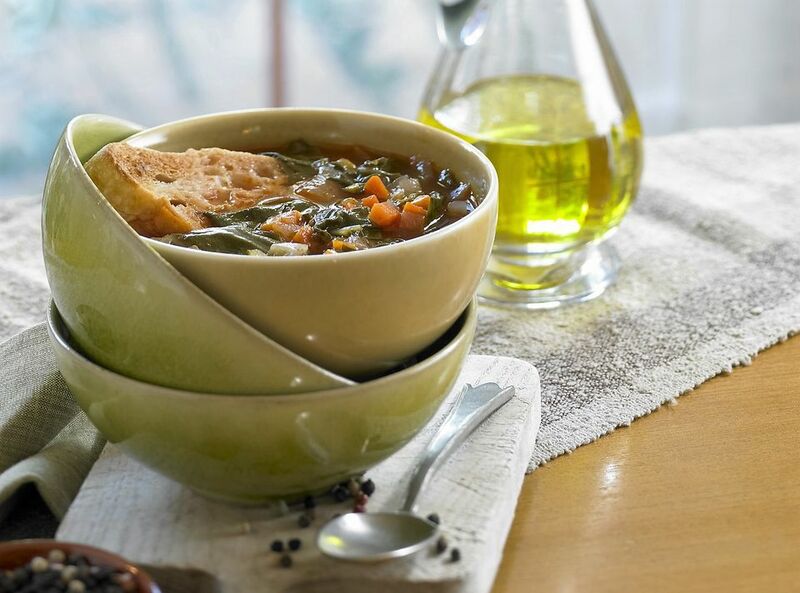 There are, in fact, many different types of "acquacotta" soup throughout Central Italy, but this particular version is from the coastal Maremma region in southern Tuscany. This soup is a nice primo (starter course) for any autumn or winter Italian dinner, or even a light lunch, together with a salad and some hearty country bread. 3-4 slices of stale country bread, toasted and each rubbed with the cut end of 1 clove of raw garlic that has been peeled and sliced in half (1 slice of bread per serving). If you don't have stale bread, you can just toast fresh bread. In a large Dutch oven or stockpot, heat the olive oil over medium heat. Add the sliced onion and saute until softened and lightly golden, about 5-8 minutes. Add the chopped celery leaves (and/or herbs) and chopped leafy green (see above for suggestions). Saute until the greens are wilted, about 2 minutes. Add the wine and cook until the alcohol smell has dissipated, about 1 minute. Bring to a simmer, then cover and simmer over low heat for 15-20 minutes. Toast the stale (or fresh) bread slices. Rub each toasted slice of bread with a clove of raw garlic, cut in half, before placing one slice in the bottom of each bowl. Ladle the soup over the toasted bread, let sit for 1-2 minutes to allow the bread to soften, then top each serving of soup with a generous grating of Pecorino (if desired) and serve. Saute chopped celery and carrot and finely minced garlic together with the sliced onions, for richer flavor. Add a poached egg to each bowl, on top of the soup. Add beans -- such as cannellini (Navy beans) or chickpeas (garbanzo beans) -- for a heartier soup. Add just a dash of soy sauce or Maggi to amplify the soup's flavor. Add dried, chopped porcini mushrooms for an earthy mushroom version. Substitute Parmigiano-Reggiano for the Pecorino. If you have any leftover Parmigiano rinds that you've been keeping (I always keep some in my freezer), this is a great opportunity to use them! Toss a 1- or 2-inch piece into the broth and simmer it along with all the other ingredients, then remove and discard it before serving. This will really amp up the flavor of your broth.